Ringing telephones, crying babies, bills to pay, papers to write, meals to prepare and meetings to attend. Often it seems that there is no relief from the frantic pace of an ordinary day. When life becomes too busy and too complicated, it is time to simplify your home or office décor. Today our subject is a home office. Millions of people around the world are waking up to the concept of working from home. With the demand for space increasing day by day, a luxurious work space separate from the rest of the house is often not a feasible option. A compact working space, however, can be accommodated without too much fuss. 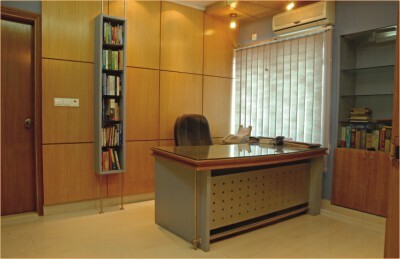 Our featured home office is inside an apartment situated in Uttara. The apartment is almost 2400 sq. ft. As per owners' requirement we divided the space into two parts, the prime space allotted for residence and a separate portion for the home office. As a designer I believe clutter free, simple design is always great. If you are a seeker of simplicity then choose uncomplicated patterns and neutral colours, cream, pearl grey and dusty pastel. Use simple shapes and straight lines to create a sense of order and direction. We took 600 sq. ft of space from the residence area for the office. This is part of the apartment, but has a separate entry door. At the entrances, we added 16” x 30” super teak board pieces with a ¼” group line border to create a welcoming mood for the reception area. Here we placed a stylish reception table, and a decorative ceiling overhead to complete the look. A curved wall creates another attraction for the office area. In the residence area, we used rustic bricks for an earthy feel, but in the office area we divided the walls into three sections, each with a pastel colour of different hue. Colour is important. The walls are kept white and grey to provide a calm, refreshing effect. We used grey vertical blinds for the long glass window that also dominates the room. Chinese porcelain tiles were applied to the floor. The off-white tiles look clean and fresh, and the line pattern brings visual interest. The simple pastel colour theme creates a minimalist, but aesthetically pleasing look for the home office. Furniture is also an important consideration for the small space. We arranged a small executive corner. Most of the furniture is made of commercial board, but the CEO's table is made of Burma teak board. We also arranged a sleek bookshelf behind the table. So, when feeling exhausted and overwhelmed by responsibilities and obligations, one can change one's atmosphere. Just make it simple, clean obstacles, unwanted goods and decorative details and choose lightweight and functional furniture. You will begin to feel a sense of confidence and freedom simply by creating a clean and open space.